All three animals come under the class of reptiles, in the taxonomic order of Testudines or Chelonia (which comes from the Greek word ‘kelone’, meaning interlocking shields or armor). They all have the major characteristics of reptiles as they are cold-blooded (eco-therms), have scales, breathe air, and lay eggs on land. The distinction between them comes mainly from what living habitat they are adapted for, though the terminology differs slightly in certain countries. For instance, in Australia, other than marine sea turtles, they are all called tortoises. In the United States, the term ‘turtles’ is given to chelonians that live in or near water. That being said, in general there are a few commonly accepted distinctions between turtles, tortoises, and terrapins. “Turtles” are generally naturally gifted at ninjutsu… or rather, they may be completely aquatic, like sea turtles, which rarely come up onto land, excepting to lay eggs. Other types of turtles are semi-aquatic and live by fresh water ponds or lakes. They tend to swim, but also spend a lot of time on land, basking in the sun and occasionally burrowing in the mud. Turtles have adapted to an aquatic life and are streamlined for swimming with webbed feet, or in the case of sea turtles, long flippers. Turtle diets are not strictly vegetarian either, they are omnivores. Depending on the type of turtle, they may eat jelly-fish, small invertebrates, sea sponges or sea-vegetation. In the case of fresh water turtles, they may eat plants or insects and small fish. Tortoises, on the other hand, are almost exclusively land-dwelling animals, usually with stubby feet, and aren’t good swimmers. They occasionally enter water bodies to clean themselves off or drink water, but could easily drown in the deep or in strong currents. Their bodies are adapted to living on land and they aren’t stream-lined like turtles, but rather display high domed shells and column shaped feet much like that of elephants. They also sometimes have sharp claws for digging . Another major distinction is that tortoises are for the most part herbivorous and primarily eat low-lying shrubs, cacti, grasses, weeds, fruit, and other forms of vegetation. Lastly, the term “terrapins” is sometimes used for turtles that are semi-aquatic and live near brackish waters or swampy regions. They’re sort of like a mix between a turtle and tortoise, as they spend most of their time divided between water and land. They are also usually small and have a hard-shell that’s shaped somewhere between a turtle’s streamlined one and a tortoise’s rounded dome shaped one. The Soviet space program sent tortoises to orbit the Moon in their 1968 launch of the Zond-5 space probe, meaning tortoises orbited the Moon about 3 months before humans. This was a test flight for a possible manned mission to the moon. The Soviets sent a payload of an assortment of living things like wine flies, meal worms, bacteria, seeds, plants and two Russian tortoises. The spacecraft first launched on September 14th, 1968, and on September 18th, became the first successful circumlunar flight with recovery, as it splashed down in the Indian Ocean 3 days later on the 21st. The tortoises not only survived their lunar mission, but the only negative side effect was about a 10% loss in body weight. Some turtles, like the Fitzroy River turtle, have a very unique way of breathing… through their rear ends. A turtle’s rear cloaca functions to expel feces and urine, and also is used for laying eggs. Some species of turtles also have vascular sacs called bursae, that allow oxygen to be absorbed, aiding in respiration. The Fitzroy river turtle of Australia is able to use this method of respiration (through its behind) to obtain as much as two-thirds of its oxygen supply. It does so by pumping water in and out of its rear end, absorbing oxygen from the water, which allows it to stay underwater for extended periods of time and even hibernate there. A turtle’s shell is made up of about 50-60 bones covered in interlocking plates called “scutes” that form its exoskeleton. The top part of the shell is called the “carapace”, while the bottom half of the shell is called the “plastron”. The two parts are connected by a boney bridge. 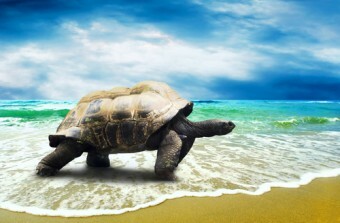 Contrary to how cartoons sometimes depict turtles, they cannot detach from their shell or crawl out. Although it may seem like the hard shells are the ultimate protective shield, it should be noted that a turtle’s shell has nerves embedded in it and so they are receptive to feeling through their shells. For example, they feel pressure of weight on their shells and if they injure their shell, they will feel the pain. The official collective term for a group of turtles is known as “bale” as in “a bale of turtles”. However, it’s not uncommon to hear turtle pet owners refer to them collectively as a “herd”. The largest of all turtle/tortoises is the ‘Dermochelys coriacea’ better known as the Leatherback Sea Turtle. It’s easily distinguished by the lack of a bony shell, which is replaced by a leathery carpace. It also has a teardrop shaped body. Adult leatherbacks have an average length of 3.3–5.74 ft (1-1.75m) and can weigh anywhere between 550 – 1,500 lbs (250 to 700 kg). When it comes to tortoises, the Giant Tortoises of the Galapagos and Indian Ocean, along with the Aldabra tortoise from the Seychelles, are the largest. There was once a Galapagos giant turtle that weighed in at 882 pounds (400 kg). It is a myth that you can tell a turtle’s age from the rings on the scutes of its shell. Although turtles accumulate growth rings, they’re not necessarily indicative of their age as they don’t accumulate these rings annually. It is believed that the scute rings show growth spurts relative to the abundance/scarcity of food available to the turtle at the time. One of the oldest tortoises ever recorded was said to have been gifted to a royal family of Tonga by the British explorer Captain Cook in 1777. The tortoise grew up in captivity with the royal family for 188 years, until 1965 when it died of natural causes. Another famed tortoise that went by the name Harriet was a resident of the Australian Zoo and was said to have been a pet of Charles Darwin before it ended up in the land down under. She died in 2006, just shy of her 176th birthday. Currently, there’s a Seychelles giant tortoise called Jonathan living on the island of St. Helena that is estimated to being around 176-178 years old. One of the most fierce species of turtles is found in the fresh waters of North America and is called the Alligator Snapping Turtle. It’s one of the largest fresh water species, growing up to 2.5 feet long and weighing as much as 200 lbs. The alligator snapping turtle is rather notorious looking with its spiked shell, sharp hooked beak, bear-like claws, and scaly, muscular tail. This species has a unique way of luring in its prey, which includes small fish, frogs, crayfish and the like. It has long tongue that features bright-red, worm-looking piece of flesh which it wriggles underwater to make it look like a worm, attracting its prey up close and sometimes right into its mouth, after which it snaps its strong jaws shut and devours it. While most land turtles are able to retract into their shells for protection, sea turtles aren’t able to do so. Their head is exposed at all times. What sometimes appears as a turtle crying is simply the way a turtle expels excess salt from its body via tear ducts. In fact, many freshwater / inland aquatic Chelonians ARE indeed called “turtles”as their common names. For example: Manning River Snapping Turtle, Western Swamp Turtle, Fitzroy River Turtle. ninjutsu??? so your telling me turtles are naturally gifted at martial arts????? Question: If turtles live dominantly in water, compared to a tortoise that does not, wouldn’t that make TMNT Teenage Mutant Ninja Tortoises? Those supposed ‘turtles’ live in a sewer, not really a healthful water-world for a turtle…. They were pets that were thrown away and ended up in the sewers. Being that they were babies when Splinter found them, they were likely some form of fresh water turtle. Hi, where did u get these infos? can u share references or books or journals that u referred to? Btw this is an interesting article! I want to know more about turtles. I read that a group of turtles is called a ‘creep’. Do not recall where I saw that and wondering now which is correct. Or could all be correct – creep, bale, and herd? It’s a bale for turtles and a creep for tortoises.